Servoy Forum • View topic - Error while deploy to Servoy Application Servoy. Error while deploy to Servoy Application Servoy. We are running Servoy 8.2.2 and i try to deploy to our application server but i get the following error "Unable to read file". Some times is does work but most of the times it doesn't. There nothing in the eclipse.log or the servoy log. And the file is present. 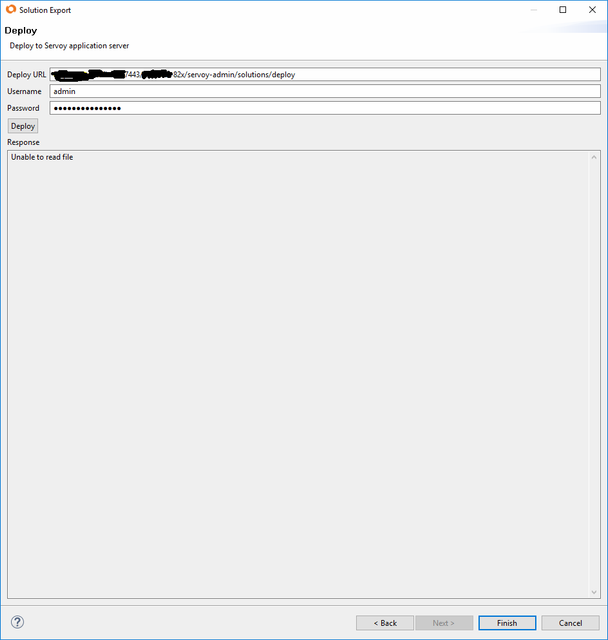 Re: Error while deploy to Servoy Application Servoy. I tried to post it with postman and it always works so somewhere in eclipse something goes wrong. Thx, any idea when 8.2.3 gets released?